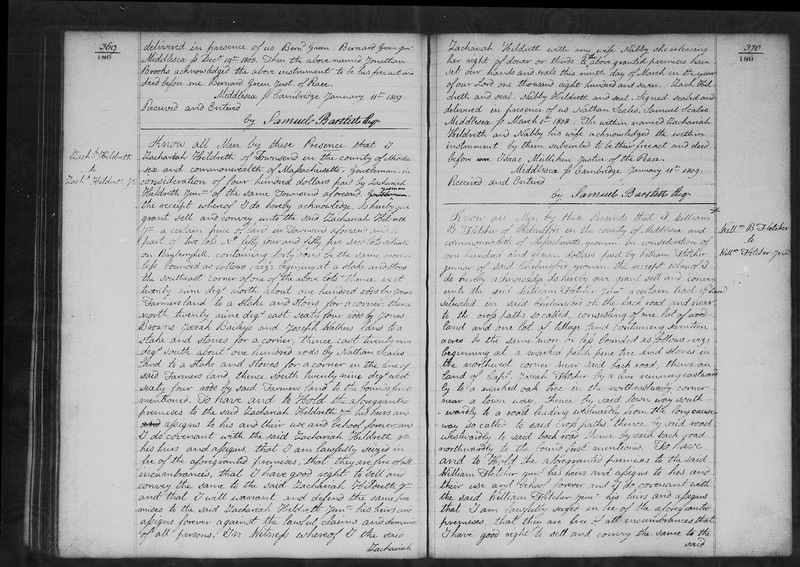 Genea-Musings: Amanuensis Monday - 1809 Deed of Zachariah Hildreth to Zachariah Hildreth Jr. in Townsend, Mass. 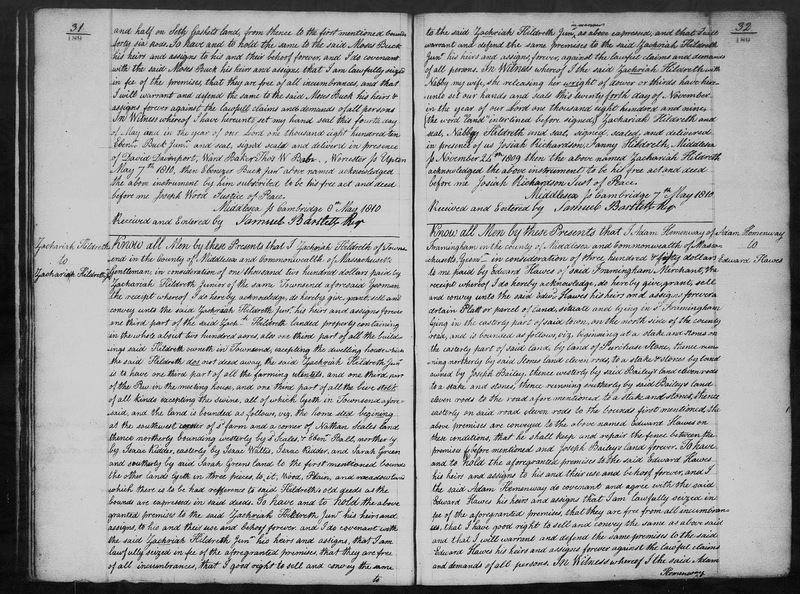 Amanuensis Monday - 1809 Deed of Zachariah Hildreth to Zachariah Hildreth Jr. in Townsend, Mass. and southerly by said Sarah Greens land to the first mentioned bounds. in the year of our Lord one thousand eight hundred and nine. before me Josiah Richardson, Just of Peace. Middlesex Ss Cambridge, 7th May 1810. Received and Entered by Samuel Bartlett Reg^r. 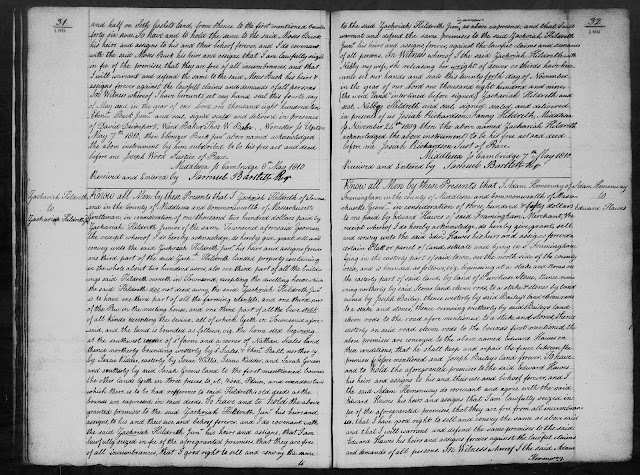 "Massachusetts, Land Records, 1620-1986," digital images, Church of Jesus Christ of Latter-Day Saints,FamilySearch (https://familysearch.org : accessed 23 September 2018), Middlesex County, "Deeds, 1810-1811, Vols. 188-190," Volume 189, page 31 (image 293 of 821), Deed of Zachariah Hildreth to Zachariah Hildreth Jr., executed 24 November 1809, recorded 7 May 1810. Zachariah Hildreth Junior (1783-1857) was the son of Zachariah Hildreth (1754-1829) and his first wife, Elizabeth Keyes (1759-1793). This is the second land transaction for Zachariah Junior in the Middlesex County Deed index for 1800 to 1835. The land sold was one third of 200 acres which is all the Zachariah Hildreth Senior's holdings in Townsend, and does not include his dwelling house. The bounds provided are, I think, for the entire parcel and not for the one third portion. Zacharih Senior may have sold other parts of his land during his lifetime to other sons. A location of this land in Townsend is not provided; perhaps an earlier deed to Zachariah Hildreth Senior mentions the location. There is no probate record for Zachariah Hildreth, Senior.